It’s been a couple days now and I’m still buzzing from the two Green Day shows earlier this week. I feel more like a teenager than I did when I actually was one. Back in May I said that Green Day’s Webster Hall show was possibly the best I’d ever seen, but I must admit that it paled into near-insignificance compared with the spectacle I witnessed at Madison Square Garden. I’ve never been a big arena rock kind of guy; most of my MSG-type shows were in the 60s and 70s and involved the likes of the Rolling Stones, David Bowie, Led Zeppelin, etc., and as I think I’ve noted, I’d only been to Madison Square Garden itself once before, on July 28, 1973, the night Led Zeppelin were being filmed for The Song Remains The Same (and, incidentally – though I still maintain I had nothing to do with it – the night they were robbed of their share of the box office receipts, some $300,000, which, believe it or not, was quite a bit of money in those days). In the 90s I saw Green Day play at Wembley and Oakland Arena, but both experiences left me, if not cold, at best slightly lukewarm. Maybe it was because on both those occasions I was up in the seats looking down on the arena floor, whereas this time I was on the floor, only a few feet from the stage. But to be fair, the floor itself was a very different affair for these shows; in Green Day’s early arena-rock days, nearly anyone who wanted to be on the floor could get there, and the result was a seething, swirling maelstrom of flying bodies and – sometimes – flailing fists as thousands of people struggled to cram themselves into a space that could comfortably fit no more than a few hundred. This time, the standing room near the stage was tightly controlled, accommodating, I would guess, about 500 people and leaving plenty of room to wander around or stand quietly if you weren’t among those who simply had to be face-to-face with the band. When I say tightly controlled, put it this way: our way was barred by a snarling MSG security guard even though we were wearing passes that allowed us to go pretty much anywhere backstage. We had to spend the first part of the show a few hundred feet back, until the wonderful Carly intervened. Carly was there to look after the several children who were traveling with the band, and for purposes of getting to where we wanted to be, we became, essentially, three more of her charges. She escorted us up to the front, patiently explained to the security guard that she was responsible for us, and turned us loose into what might have been the ultimate punk rock playpen. I don’t say that disparagingly, either. Oddly enough, it felt a bit like being at Gilman (which also was described as a playpen or “punk rock Romper Room” by those who felt it wasn’t truly punk if limbs, teeth and blood weren’t at risk). There were almost none of the boneheads whose idea of a fun show involves beating up those smaller than themselves, and almost everyone right up front knew and loved the band’s entire catalog, from 1988 to the present, well enough to sing along all the way through, and to cheer ecstatically when some of the long-neglected songs from the first two albums were resurrected. It wasn’t until I got home, till the next day, actually, that it occurred to me that those sitting up in the seats, especially in the upper balconies, would have had a very different experience, and that the almost intimate little concert we enjoyed at the very front was only possible because the vast majority of the audience was barred from being there. But it really did feel intimate. At times, like when Billie was out at the end of the catwalk that protruded into the crowd, we were actually behind him, looking out at the audience from a very similar perspective to what he was seeing. And I found myself thinking, “This place isn’t that big, in fact it feels almost kind of cozy.” Of course, a great deal of this is probably down to Billie’s ability – whether he’s bellowing AY-O and insisting that people put their hands in the air, or singing a heartfelt ballad accompanied only by an acoustic guitar – to connect with people throughout the amphitheater, those marooned far up in the nosebleed sector as much as those standing awestruck at his feet. 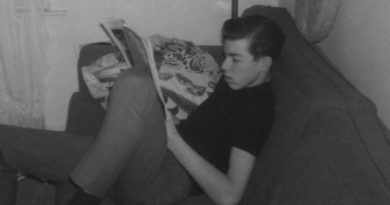 I’ve often spoken and written about how, when I first saw Green Day (then known as Sweet Children) playing for five kids in a candlelit cabin in the Mendocino mountains, Billie performed like “the Beatles at Shea Stadium.” Even though he was just 16, and the band was playing only its third or fourth show ever, I could, I thought, easily envision them displaying the same commanding presence on the biggest stages in the world. It seemed like a crazy idea at the time, and most people I told about it laughed at me and/or told their friends that I was losing my mind. Well, I may not have been right about many things in my life, but I think I nailed this one. I’ve seen Green Day in bigger venues – headlining the 2004 Reading Festival, for example – but I’ve never seen them or any other band so thoroughly command a stage and an audience. The Rolling Stones at the LA Forum in 1973 might have come close, and Alice Cooper at Cobo Arena in 1971 made a good stab at it, but… ah, I can think of one performance that might have given Green Day a run for their money: the Who at Woodstock in 1969. But while that performance might have contained moments of grandeur and majesty that surpassed what Green Day produced at the Garden this week, it was also diminished by lulls, longeurs, and the simultaneously satisfying and upsetting spectacle of Abbie Hoffman getting knocked cold by Pete Townshend’s guitar. There have been times in my life when I was enough of an unbearably punk purist to turn my nose up at the elaborately produced and tightly choreographed sort of rock show that Green Day have now honed to a fine art, but that’s just one of many ways in which I’ve succumbed to the prevailing idiocy rather than think and judge for myself. When I went to see La Traviata at the Sydney Opera House, I didn’t complain that the production was too ornate or expensive, or that the sound was too slick and clean; instead I marveled at how the talents of the set and costume designers combined with those of the composer, the performers, the sound and lighting engineers, even the ushers and ticket takers, to create a living monument to what was bright and glorious about not just art and civilization, but to the very essence of what it is to be a human being: the desire, no, the need, to constantly transcend oneself. Okay, before I risk climbing any further into the heights of grandiloquence, let me point out that, yeah, dude, this show also totally rocked and they played (almost) all my favorite songs, etc. I was especially ecstatic to, early on, hear the opening chords of “Holiday”, which was noticeably missing from their New York shows in May. In fact, that’s exactly when the feeling kicked in, the one that let me know I was in for one of those shows that I would remember and treasure all my life. What more could I have asked for? Well, “Christie Road” would have been a thrill (he did sing a couple bars of it during his “Shout” breakdown near the end, and on Monday night Nate Doyle and I were screaming like crazy for “Dry Ice”, a song I’ve been (mostly unsuccessfully begging them to play ever since they dropped it from their repertoire sometime in the early 90s. 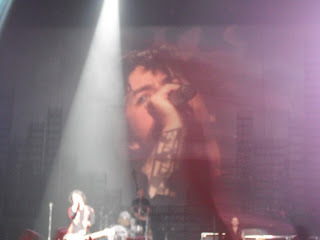 Someone also threw an outsized pair of men’s briefs at Billie, on the back of which was emblazoned “No One Knows”. It was going to happen, of course, but it was a sentiment I heartily endorsed; for many years I cited it as my favorite Green Day song ever. But between the two nights we did get to hear “Going To Pasalacqua” (aka “Here We Go Again”), “Who Wrote Holden Caulfield”, “2000 Light Years Away”, “Welcome To Paradise”, “Disappearing Boy”, and a not nearly so old, but equally unexpected treat, “Macy’s Day Parade”, enough to satisfy all the most curmudgeonly old school Green Day fans (there are still some who bristle any time the band plays anything newer than Dookie, but since American Idiot and 21st Century Breakdown are my favorite Green Day albums of all, I had no problem at all with hearing much of the former and most of the latter. The band played two hours and forty-five minutes on Monday, which cost them quite a bit of money, since they were heavily fined for going past the Garden’s curfew. So I halfway expected them to cut things a bit short on Tuesday. Instead, they played almost three full hours. There are not many bands – in fact, of the bands active today, I can’t think of any – who could pull this off. I usually get impatient when a band goes over 30 minutes, unless it’s one with a lot of history and hits behind it, in which case I can stretch to 45 or 50 minutes. But not since my days of watching the Grateful Dead on seven hits of acid have I voluntarily subjected myself to multiple hours of of one band’s music, and yet I could easily have watched at leat another half hour of Green Day. More that that if they’d dug up some of the more obscure gems from 39/Smooth, Slappy, 1,000 Hours and Kerplunk. I’ve already commented on the inspiration provided by Stephanie’s guitar playing on “Jesus Of Suburbia” (and was totally stoked when she responded to my blog entry! ), but her star turn shouldn’t obscure the fact that nearly a dozen other kids were invited up on stage over the course of the two nights, and all – all but one, I should say – acquitted themselves magnificently. So much so that many people have expressed suspicion that these little guest spots are planned in advance, but it’s just not true: Billie indeed does pick people right out of the audience. His wife was telling me how he’s developed a real sense for who is up to the task and won’t succumb to crippling stage fright. The boy who looked to be about 12 or so and played bass on “Longview” showed no such tendencies; before he was halfway through the song he was tearing around the stage as if he’d been born on one, and at the end jumped up to the mike and shouted, “Thanks, Madison Square!” He also walked off stage with a brand new bass, courtesy of Mr. Dirnt. On Tuesday night, my friend Jim Kim was standing more or less behind me for the entire show, and he’s posted this portfolio of photos that should give you an idea of what things looked like from where we were. However, the photo to the left was taken by my 13 year old nephew, Jackson, who, despite it being his first attempt ever at photographing a big rock concert (and using my new camera for the first time ever), produced a number of pictures that totally eclipsed any of my efforts. To be fair, on Monday night, when I had the camera, I wasn’t quite close enough to get any really good shots, and on Tuesday night, when I was, Jackson had the camera, but was farther back engaging in kid-type shenanigans with the Armstrong boys and other members of Emily’s Army. I never saw any kind of show until I was 16, so I can’t even imagine what it was like for him, but as far I was concerned, if there was anything greater than seeing Green Day at the height of their glory, it was being able to share that experience with my completely awesome nephew. I really enjoyed reading this. It was great to read a review written by someone who has known the band for so long, worked with them, etc. Especially since you’ve seen them play at tiny clubs, and now witnessed them play at MSG, which is the biggest difference imaginable. I bet that was an amazing experience. Wow…I had never read this one before. Great review from one who obviously knows what he’s talking about. I became a Green Day fan during the lull after Warning and have been to 3 Green Day concerts and the Foxboro Hot Tub concert in Dallas. For me, the small venue FHT concert was better than the American Idiot tour shows; but when I saw them in Houston this past August, I can honestly say they have perfected their art. I am also loving all of these gems they are pulling out this time around. At the show in Houston he played Pulling Teeth during his acoustic set. I just about passed out from the excitement of getting to hear this rarity live. My first(and up to 6)Green Day show was last year. I am so old, and have rotten knees, had to be in seats, though I barely sat(and even then on the top of the folded up seat). Had great seats, but also the very top row, almost to the farthest possible seat, and I enjoyed that one every bit as much as the others. I’ve seen many great rock shows, including The Beatles, The Who, Springsteen, and Green Day’s shows beat out all of them for sheer, crazy fun! I dragged my adult sons, my husband, and friends to the Green Day shows, and every one of them had a ball. Hope people listen to you, because they truly will be sorry if they miss them. So, when is the Spy Rock, part 3 coming, lol! Love your writing!